Issues such as education, healthcare, the suffrage movement, and the arts have been championed by the first ladies and the exhibit also highlights their life after office. 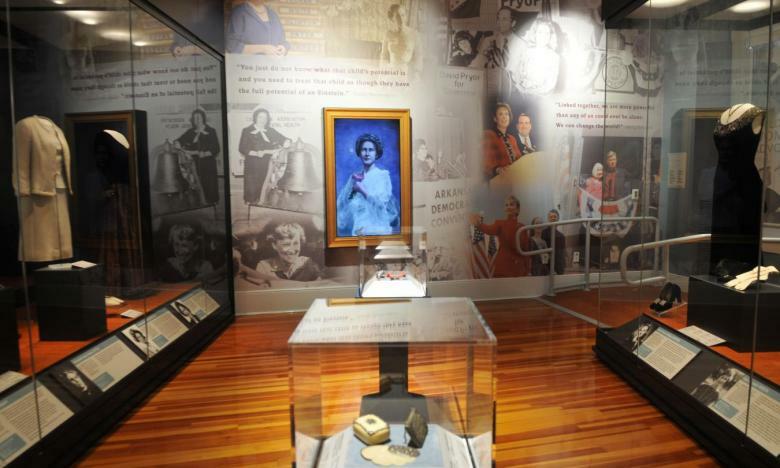 The exhibit showcases the accomplishments of governors’ wives throughout Arkansas’s history. You can learn about Mary Jane Bradley Conway, Arkansas’s original first lady. Her husband was James Sevier Conway, who took office as Arkansas’s first governor after Arkansas became a state in 1836. His final resting place is the 11-acre historic site Conway Cemetery State Park in southwest Arkansas. Anne McMath’s hand painted campaign gown is in the exhibit and highlights the accomplishments of Arkansas Governor Sid McMath during his first term in office. The McMath's were the first family to live in the Governor’s Mansion, which was completed in 1950. Hillary Clinton’s 1979 inauguration gown, which was designed by Little Rock designer Connie Fails, is also on display as well as more information on the accomplishments of this former first lady of Arkansas who went on to serve as first lady of the United States, a U.S. Senator, the U.S. Secretary of State and a nominee for President of the United States. The well worn and duct taped hiking boots of Gay White, who served as first lady in the 1980s, are also on display from her Grand Canyon adventures. The gowns and artifacts will be rotated once a year in the gallery, which now includes motion-activated lighting and temperature controlled cases. The exhibit will also be added to. Text panels include a quick bio of the first lady and information on their gowns if one is shown. The Old State House Museum, which is located at 300 W. Markham, interprets Arkansas history from statehood to the present. Built in 1836, the Old State House was the state's original capitol until 1911. Admission is free and open to the public. Hours are from 9 a.m. to 5 p.m. Monday-Saturday, and 1-5 p.m. on Sunday. For more information, visit oldstatehouse.com.